I went out on a limb and got this in a 2-for-1 deal. Was more than a little hesitant considering I've owned less than 10 comic books in my life, but I wanted something non-fiction / educational and tend to enjoy historical books, even if the subjects are unfamiliar. Anyway, even though I still have no interest to pick up a comic book, I have no regrets in picking this up and feel I can understand the love of comics now and have at least cured myself of ignorance in the history of comics. However, what I really gained from this book was an interesting look into the viewpoint of the mob, in the generic sense. Those who would rather waste the energy and attention into destroying something they consider strange or evil, rather than channeling that passion and focus into producing something good. The sort who skilled in creating hate and are not only proud in their talent, but are celebrated, for a short time before they are forgotten or turn their attention on a new target. Having recently read/listened to &quot;The Ultimate History of Video Games: From Pong to Pokemon&quot; and a similar history of Dungeons and Dragons, where the same single mindedness was aimed at the destruction of video games and RPGs. It becomes depressingly obvious that events do repeat themselves and society will probably continue to lash out at any shifts in culture before any evidence can be gathered while they are lead by those who prefer to see society frozen in the blissful memory of their childhood. 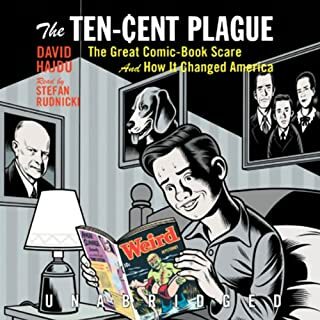 Beyond the more gloomy sections of the history of comics, there is plenty of humor in this narrative along with the bright and dark sides of the corporate world. The narration was great, though some did complain of mispronunciations. I didn't really notice. For those interested in this book, I will also recommend &quot;How Star Wars Conquered the Universe, The Ultimate History of Video Games, Super Mario: The History of Nintendo&quot; and &quot;Masters of the Air&quot; a history of the air war over Europe. I have nothing against the cover, but it does suggest a more childish book than I what I got, which was good. It was pretty complex and didn't pull the punches I was expecting it to, which I enjoyed. These dragons were often cute, but they were also cruel. Has a nice message of: The world isn't going to fair because you want it to be. You can accept it for what it is or you can do something about it. My first listen of this book and series was not wholly encouraging. 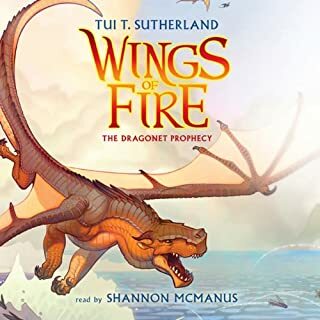 The narration seemed clunky, I remember constant mid-sentence breaks that drove me nuts and a fantasy world that seemed simple enough but still managed to confuse me despite the story's slow pace. I had trouble keeping track of characters who all seemed to have similar names. (Leaf, Petal, Pond, Root, etc) But I liked the world and characters enough to continue on and on through the series. Having all but finished the series, I decided to start again with a better understanding of the world and characters and the whole thing just clicked. The narration was great (perhaps I managed to listen to the whole thing at a reduced speed or just grew accustomed to it) and I could focus on the smaller details rather than trying to puzzle things out as the story plowed ahead at full steam. Even the pacing feels improved, though I still consider it a slow burning plot. Looking forward to refreshing my opinion of Book 2. I've listened to two of the current three novel series (which I mildly regret, for there were spoilers for BK 3: Siren's Depths, in the first short) and I found that these short stories held my interest more consistently than either of those novels. The first short, The Falling World, was my least favorite for this reason. It was long enough to suffer from novel-like pacing and had a conflict that felt like a mediocre Dr. Who episode. The second, The Tale of Indigo and Cloud, was my favorite. Set in the court's past, which seemed cheery and upbeat when compared to the presently stiff court. This difference in emotional tone was likely a heavy point in its favor after hundreds of pages of reserved dialogue from Moon, Stone, and Jade. I enjoyed the cast of characters as well. I even listened to it again after I finished the collection. I found the Forest Boy to be equal parts cute and eye rolling cliche. I enjoyed it in the end. You can't really dislike a childhood Moon. I was skeptical about the last one once I realized what it would be about, but enjoyed it as well. Either I was enjoying myself too much to notice or the narrator was enjoying himself as well and did a better reading because of it. 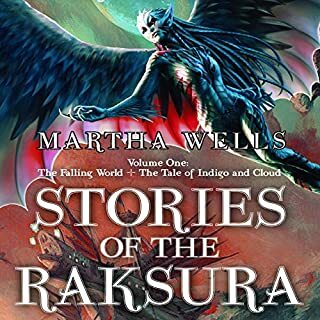 The narrator was not what I wished in the novels, but after the first story in this collection, I don't remember any odd and distracting pauses that seemed to fill the novels. Yes there are quite a few loose ends (with even more added in the last moments) considering this isn't mentioned as a series. I'd guess its intended to be the prologue for the next Mistborn trilogy but who knows. Beyond that this is what I have to say of the story. 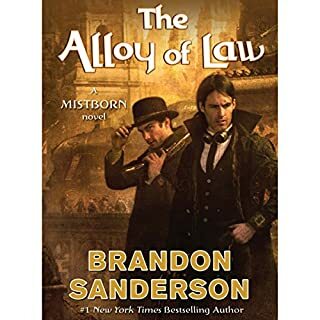 This isn't a western, just think of it as Mistborn with a bounty hunter as the main character with guns and trains in the mix. The provided summary explains as much as can be. There are only three protagonists in this book compared to the many major and minor of Final Empire (400 less pages will do that.) Wax, his sidekick and a girl who I'll avoid names to keep spoilers out. Wax reminds me of Elend (but less classy and twenty years older). He's interesting, your basic lawman with a past but like Elend spends too much time thinking to be an effective main character but he is. This causes the build up to be sluggish and passively sluggish at that but interesting to see how the world has changed. His sidekick like Kelsier in the first series is more interesting and I enjoyed every scene he was in. He's also one of the new allomancers, with the ability to slow down time outside a bubble he makes and uses it in a very fun and unique way. If there is a sequel I hope to see more of him. Lastly there's the girl. She's educated, good with a rifle and around when it counts but like some other female protagonists of sanderson's, sort of just falls into line and most attempts to be remarkable are foiled. What doesn't make sense is that Sanderson does good female characters (in my knowledge and opinion) and there are at least two in this book that are interesting and entertaining. They just aren't first choice as the main heroine sometimes but he is improving in character building. The magic however is better than ever. As I believe Sanderson said, its not what you can do with magic that's interesting, its what you can't. With no actual mistborn in this novel, there is no one to be the living disaster known as VIn . No devastating force on one side or another (but Wax comes close in top shape). It matters much more here how you use your powers than just how much of them or fuel you have. 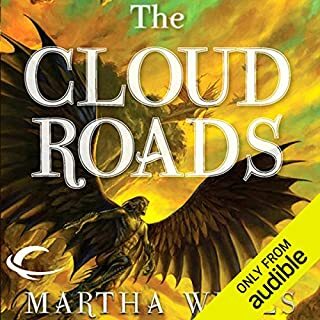 The narration is what I expected being a mistborn and wheel of time listener, enjoyable and clear. So as long as there's a another book coming at some point (though I'm tiring of in the air endings) I can easily give this book a four out of five. Take Atlantis the Lost Empire and add Zombies. The very basic run down is there's a "magical" city that randomly turns people into gods. One day you're a whiny farmboy, the next morning you're a whiny deity with glowing skin, who can write magic spells in the in the air. (There are no whiny farmboys in this book.) 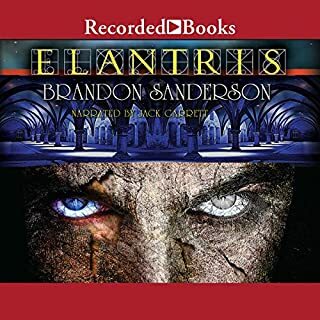 Then ten years ago the magical city, Elantris, became much less magical and all the Elantrians became more ghoulish than godlike. Since then the city curses people instead of blessing them and basically turns them into zombies. The zombies get gathered up and thrown into the slum pit Elantris has become and are left there to die.... completely. My main problem with this book is that a lot of the character's goals get dropped or become irrelevant before they're completed. Also I wish more time would have been spent in Elantris and less on the actions of the other characters for the previously mentioned reason. The princess could have probably been removed with little effect to the plot. Finally the story felt too happy. Sanderson didn't want to make it gritty, but it never got within shouting distance of that till the second half. This book probably has my favorite opening line of any book I've read so far and the villain is more interesting and more conflicted than I'm use to but after reading Mistborn, Warbreaker and The Way of Kings, Elantris fell short in places. The narration was enjoyable but it didn't really stand out either.